I can’t believe it’s almost three months since I was in India on my first assignment with Monsoon – Wycliffe International Asia-Pacific Communications Department. 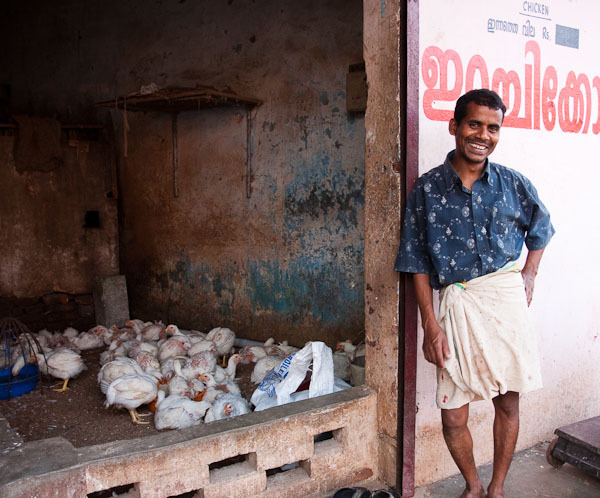 I’d better tell you all about India – what a story! The celebration event itself was definitely the highlight of the trip. The 1200+ people who attended were so excited to be there and receive a copy of the Bible DVD. Walking around with my camera, everyone wanted me to take a photo of them. They didn’t want to see it, they were just happy that I took their photo, that they were there. Afterwards, as food was being served I wandered around trying to grab candid shots of people signing to each other – and everyone wanted to talk to me. I didn’t know any sign language at all, but some signs became obvious, everyone asked me the same thing. Where are you from? Are you Deaf or hearing? Do you know Jesus? Are you married? Do you have babies? I greatly regretted my inability to communicate. Finally Augie, one of the Kenyan men translated for me, then taught me the sign for Australia. You bring your hands towards your chest and then into a position like a standing kangaroo! I laughed when I saw that, and the others starting making signs for cricket. We rejoiced in this small communication success. At one point, I was crouched next to a couple of beautiful Deaf Indian women, and one of them mimed and asked me –How can you understand what is happening on the screen since you can’t understand sign language? I mimed that there was someone down the front translating into English in a microphone, and I was listening to it. “OHHHH!” her face said. When people finally started heading home late that afternoon, dozens filed past me as I stood near the doorway, pointing to my camera, giving me the sign for ‘good’ (thumbs up), and the sign for thank you. I’ll never forget that. I guess they were saying – thank you for taking photos, thank you for your help, thank you for being here. But, I’ll start from the beginning. Dawn, my boss, emailed me about a week before Christmas last year and said – ‘Hey, wanna come to India at the end of January.’ (Well, in as many words). I wrote back straight away with a ‘um….YES!’. I love to hit the ground running. I was at the Indian consulate soon after the New Year broke, applying for a visa, and the rest of January was a whirlwind lead up to the trip. Always striving for excellence and nervous about doing a good job on my first trip, I threw myself into preparations. Sourcing new photographic equipment, brushing up on my Adobe skills, calling together a prayer team and talking about metadata requirements with Monsoon’s stock gallery production manager – a very lovable Japanese-Canadian man named Kenji. Over the last couple months, people keep asking me – “How was India?” Well, how do I give a short answer? It was amazing. They are doing really incredible work. It was such a privilege to meet the Deaf translation team. I met hundreds and hundreds of Deaf people, and they are all so excited to be able to understand the Bible and learn about God. We interviewed Deaf people who all signed a similar sentiment – they wanted to know God, but they just couldn’t understand at church, or when people tried to explain things to them. But now they are so excited and I quote, “now Deaf people can be saved”. To be honest, I was close to tears the whole time. I couldn’t believe that this was the first time anyone had bothered to communicate the gospel to the Deaf community. And I couldn’t believe how many Deaf people there were. I thought the dedication event would witness a large room full of people, maybe two hundred – but the 800 seat auditorium was packed! And another 300 were waiting outside! 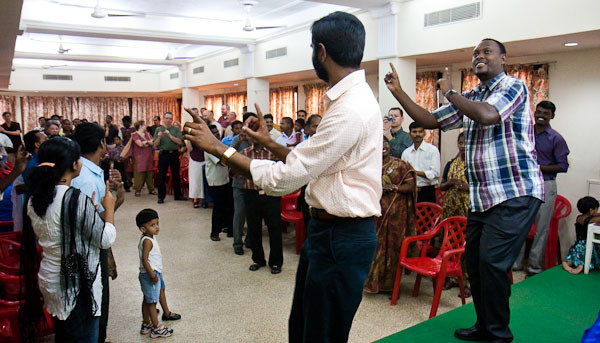 There is an estimated 9 million Deaf in India alone. They are hardly a minority group. Just a silent group. A forgotten group. As for just being in India – I loved every minute. We were there barely 6 days, but whenever I had a quiet moment I would look around, sigh deeply and think – I’m in India! I came to India on my first overseas trip when I was sixteen and it holds a special place in my heart. Visiting the state of Kerala was very different to my first trip to the slums of old Delhi and Chandigarh in the far north. Surprisingly, Kerala was much less populated, and much cleaner. I guess it has been 11 years since my first visit. Even though it was the height of ‘winter’, the dry season, it was incredibly hot. Our schedule was packed. SungWook, the videographer, and I flew into Kochi just before midnight on a Thursday, and luckily for us there was a festival on that night which ‘finished’ with a barrage of fireworks at approximately 4am. I always travel with earplugs, but SungWook, at breakfast the next morning, was so funny in his polite Korean way saying, “I am curious… as to why they have the fireworks at 4 o’clock in the morning? Why is that?” The next day we were up early, being introduced to the DOOR International team, a group of Deaf Americans who were there having strategy meetings and attending the dedication event the next day. SungWook and I interviewed 4 of the DOOR USA staff and 2 DOOR Africa staff who had come over from Kenya. We were nervous about interviewing in sign language – since we’d never done that before, but we had an excellent interpreter to help us – named Camille. She and I would sit next to each other with the camera over my shoulder, and she would sign my questions, and then voice the answers. It was much easier than we thought. However, we got our first taste of the differences between Deaf culture and hearing culture. The Deaf interviewees didn’t want to sit on the couch we had set, since the arms of the sofa restricted their ability to sign. Of course. Also, we had to pull the curtain across which was necessary to light up the face, but the strong backlight obstructed their view of the interpreter. Another oversight. Later in the afternoon, we went to the auditorium and during rehearsal we momentarily lost electricity which is common in a developing nation like India. The lady I was talking to made a comment remarking as much, and we continued our conversation in the dark. However the Deaf people had to find torches just so they could ‘talk’ since their only form of communication is shut off without any light. All day Saturday we were at the celebration event, taking photos and interviewing. On Sunday we attended a Deaf church service in a rented hall near the hotel. That was a treat – joyful sign language worship and a discussion style service. I’m told the discussion would usually go on all day throughout the afternoon – as those preset are eager to learn and nut out theology together, but they cut it short for our sake. The media team – Dawn, SungWook and I visited the translation office to get some footage and photographs of how the work is done. On Monday Dawn and I travelled about 3 hours by car to a smaller town called Thiruvalla to visit some other staff members. We stayed in a hotel that stated on their website ‘the guest is equal to god’. Well, all I can say is I think God would appreciate some clean water and internet. :) On Wednesday we travelled back to Kochi for our midnight flight back to the Philippines. So many things struck me on this trip. Perhaps the most of all is the great care that the translators have put into their DVD project. Being Deaf themselves, and part of the local Deaf community, they know what Deaf people want, how they think and how they like to receive information. Their product was so lovingly crafted, and so well received. While in India I was processing the images in every spare moment, and was able to hand them over to DOOR staff before we left. Immediately upon my return to Sydney I started writing. First a short article for Wycliffe Australia, then another longer one, testimonies, quotes and even a video script! A few months later, I’ve only just finished all this work. But, I’m not sure I’ll ever be finished writing and sharing stories about the Deaf community’s excitement to understand God’s word.